Seven Cincinnati-area developments have been awarded nearly $9 million in tax credits from the Ohio Development Services Agency (ODSA) through the state’s historic preservation program. Six of the seven area projects are located within the City of Cincinnati, and one is located in downtown Hamilton. The Cincinnati-area projects took home nearly 25 percent of the total $35.9 million distributed in the program’s ninth round of funding, and will create more than 130 new housing units and tens of thousands of square feet of commercial space once completed. Eden Park’s 118-year-old pump station may soon see new life as a micro-brewery thanks to a $1 million tax credit from the State of Ohio. Rendering provided. According to state officials, projects receiving funding must complete the rehabilitation work in accordance with the U.S. Secretary of the Interior’s Standards for Rehabilitation before the credits are issued to the building owner or long-term tenant. More than $3.3 million in funding will flow into Over-the-Rhine for Losantiville Apartments, Abington Flats, and Pendleton Apartments through the program, and the Cincinnati Center City Development Corporation (3CDC) was awarded $1.8 million for its $9 million redevelopment of three historic buildings at Third Street and Main Street in the central business district. In Mt. 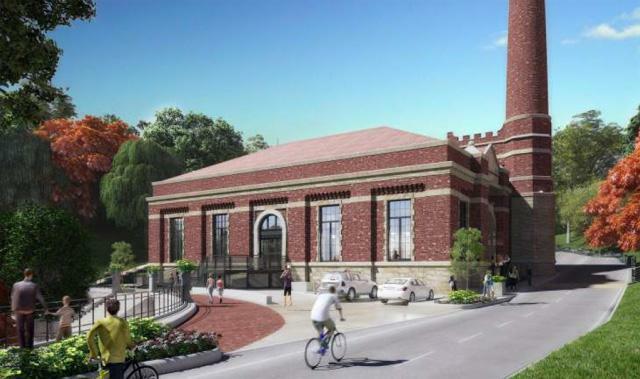 Adams, the Cincinnati Beer Company was awarded $1 million for its $5.2 million project that will transform Eden Park’s 118-year-old pump station into a brewery and tap room. Nearby, the Walnut Hills Redevelopment Foundation and The Model Group were awarded $1.8 million to renovate three historic structures into 30 market-rate housing units and approximately 7,000 square feet of street-level commercial space. Elsewhere, the City of Hamilton will see more than $800,000 go towards the renovation of the 126-year-old Hamilton Journal-News Building, which will become the home of Butler Tech’s School for the Arts and Hamilton City Schools’ Adult Basic & Literacy Education (ABLE) program. According to ODSA, this round of funding will assist in the rehabilitation of 45 historic buildings throughout the state, and leverage more than $252 million in private investments.